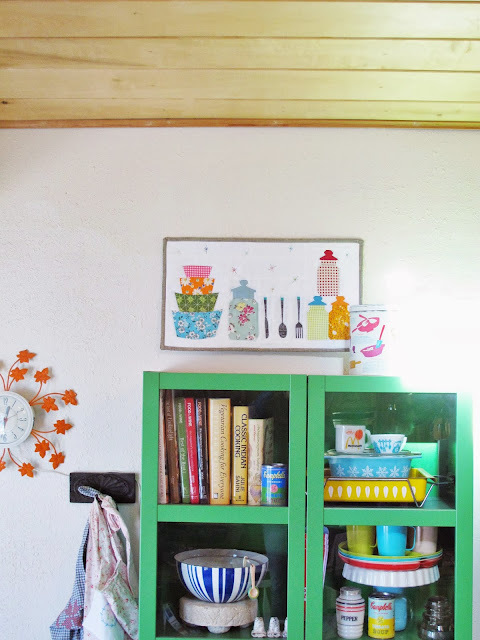 Several people expressed interest in making their own "In the Pantry" mini so I put together a quick tutorial to help! First of all, you'll need to purchase the "In the Pantry" pattern set from Kerry and I's Sew-Ichigo shop. The pattern set is chock full of possibilities. Kerry has come up with 4 variations of the canister jar, and the set also includes my Mama's Pyrex pattern as well as the silverware. Next, using this diagram, you will sew it together. 1. All the blocks are at 100% unless indicated by the diagram. 2. All seam allowances are 1/4''. 3. Some of the sashing pieces will be slightly bigger than the block they are being sewn to. That is ok. Just trim the sashing pieces down after you've sewn each section. And trim each section as you go. 1. 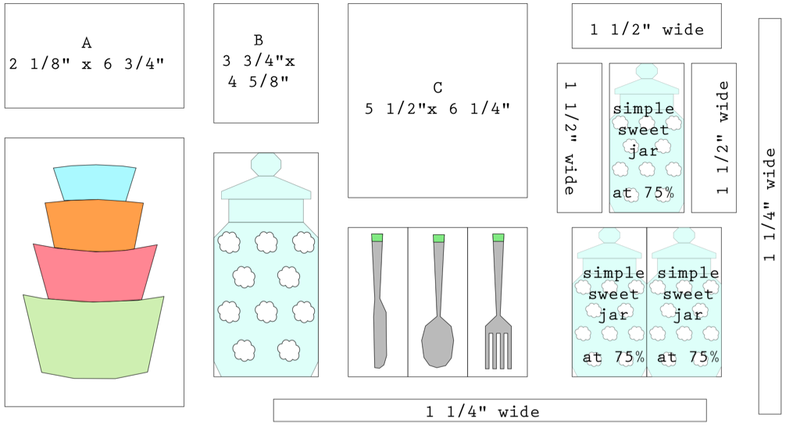 Sew one of each block: mama's pyrex, simple sweet jar, knife, spoon and fork. Sew three simple sweet jars at 75%. 2. Sew sashing A to the top of the mama's pyrex block. 3. Sew sashing B to the top of the largest simple sweet jar. 3. Sew the knife, spoon and fork blocks together as indicated in the diagram, then sew sashing C to the top of the blocks. 4. Sew two of the smaller simple sweet jars together side by side. 5. Sew a 1 1/2'' sashing strip to each side of one of the smaller simple sweet jars. 6. Sew a 1 1/2'' sashing strip to the top of the jar in step 5. 7. Sew the small jar in step 6 to the top of the small jars in step 4. 8. Sew the large jar to the left side of the utensil block. 9. Sew the small stacked jar block to the right side of the utensil block. 11. Sew the mama's pyrex block to the left of the jar/utensil block. 12. Make a quilt sandwich, quilt using sparkles with Aurifil thread, then bind. If you make this mini, Kerry and I would love to see it! You can tag me on Instagram (I'm @sewtakeahike, and please use the hashtag #sewichigo) and/or you can post it on flickr in the sew-ichigo group here!